2,568,410 – STAGE 1 – MOOT. The first stage features lush scenery, such as trees, bushes and floating rocks and a checkerboard floor. I don’t envy the fantasy zone council workers who had to paint these I tell you. Bushes trip you up, whilst hitting a tree or rock kills you. However, you can shoot all of the above, so I suggest you do this instead of colliding with them (Sull’s Obvious Tip #1). Enemies hurtle towards you with the greatest of speed but with the poorest accuracy. They’ll aim for where you are so keep flight of foot ( or jet pack ) and keep moving. Aside from the stationary objects, the only enemies which will cause you any issue on the stage are the Tomos which can only be hit while they’re open. At the end of the level a huge fire ball breathing dragon awaits. It’s only weak point is it’s head. Hit anywhere else and your bullet ricochet like a poor stand up’s punchline. Shoot him five times in his fizog in order to change his color enough to destroy him. You know he’s ready for the knackers yard when he turns red. One more and he’s outta there! STAGE 3 – AMAR Now it’s got pretty trippy. What do you mean it’s trippy enough already? This level replaces the bushes with ginormous magic mushrooms and rocks with huge fungus balloons. Theres a lot to take in on this stage and the action ramps up to a frenetic pace. A fungus balloon ends my life. Game over. STAGE 4 – CEICIEL This is not for the claustrophobic. A ceiling lowers and we’re into avoid-em up territory as wave after wave of columns and static metal balls come at you, interspersed with the odd enemy ship. The static balls are only ever at the top or bottom of the screen so they’re pretty easy to avoid. Make your way beyond these and then end of the level boss or bosses is the first time you come face to face with the big robot Space Harrier is sat in the shoulder of on the title screen. They’re rapid moving, catch me off guard and it’s game over. 7,880,190 – STAGE 4 – CEICEL This time I go on a bit of a tear and pass through stage 4 with nary a scratch. 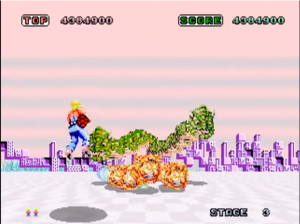 Keep moving and quickly destroy the the robots at the end of the stage rather than dilly dally and they’re not really much different to regular enemies. Which is what they end up being in later levels. STAGE 6 – OLISIS These stage names are bonkers aren’t they? It’s almost as if someone has fed scrabble tiles to their dog and made the names up from each dog egg. Olisis is wave after wave of jets and the aforementioned robots from stage 4 along with an abundance of columns. Also there is a single red robot who is a lot harder to hit. He nails me and it’s curtains. 8,611,090 – STAGE 6 – OLISIS This time I reach the end of level boss who appears after you defeat the single red robot. The boss is a cluster of GM modified blue peanuts unleashing a constant stream of bullets at you. It sit’s stationary in the middle of the screen and as such is not much of a threat. Simply rotate round clockwise (or anti-clockwise) shooting at all times and he’s easily dispatched. 10,154,250 – STAGE 7 – LUCASIA The end of level boss is a circle of eight enemies which rotate clockwise, open and shoot at you. 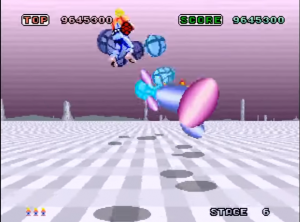 Like the level before these are easily defeated by circling round the screen. Lead on MacDuff to Stage 8! STAGE 8 – IDA With a title like that, it can only mean one thing. A small dog egg. Oh sorry, I meant a level featuring everyone’s favourite creepy stone head, Ida. This stage is something of a greatest hits in terms of foes. 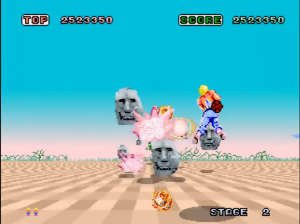 All manner of bad guys make an reappearance wanting to rearrange Space Harrier’s face. 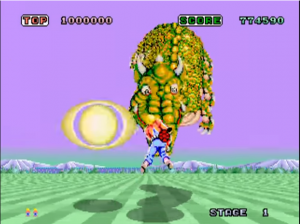 This is due to Ida’s stony complexion and he’s overwhelmed with envy on account of Space Harrier delicate complexion and flowing golden locks. Jealousy only gets you so far in life and it’s proves to be Ida’s downfall as I reach the end of the level, which again is a head circled by Ida’s as in Stage 2. This time the central ugly bonce is a tad tougher to kill. Seems to require a lot of shots and certianly faster than the previous incarnation. But I manage to progress to Stage 9. STAGE 9 – REVI This level plays like Stage 4. The ceiling closes down and it’s a case of avoiding columns and static metal balls again. And due to losing concentration, I don’t. Game Over. Which is disappointing considering I’m a dab hand at Stage 4 after a week or so of playing this but I have passed my own personal 10 million benchmark. 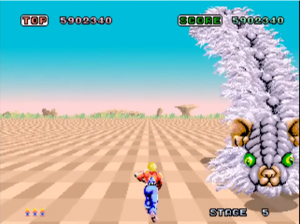 And with that it’s Ten Pence Arcade deadline time… The years have been somewhat kind to Space Harrier when compared to it’s contemporaries. Yes, the sprite scaling is a tad stuttering when observes through a modern day prism. The music on the other hand still stands up. Composed by Hiroshi Kawaguchi (who also composed the brilliant Out Run themes), it’s a rampant beat driven throwback to the 80s so much that you can almost smell the Soda Streams and Hai Karate. The main cristiscm has to be the viewing angle. And until you become familiar with the game it’s this that lets it down at times. Why allow the Harrier to run across the floor but position the camera in such a way that you can’t see the onrushing objects due to his arse? And this is not restricted to ground travel either. 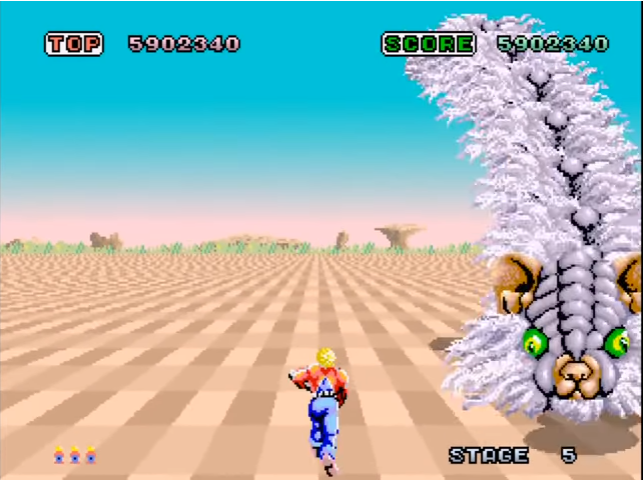 When getting to grips with the game in my early attempts, I was often killed by enemy bullets or trees or columns which I simply didn’t see due to Space Harrier’s backside so much I rechristened him Space Rearer. All this means however is that until you become familiar with the stages and the enemy patterns you have to keep moving as if you’ve had an onset of St Vitus’s dance. As with some of the old games, going back is not always a good idea. Rose Tinted glasses and all that but I can say that this has aged very well and is worthy of a revisit every now and again. To get the most fun out it though, I suggest seek out an original cab with the original flight stick controls. There’s currently one at Arcade Club for those in the UK. For those on MAME I really advise you get a PS or XBOX controller configured. I used an old PS3 one I had knocking about along with the instructions over at Digital Trends Certainly beats a digital stick and god forbid a keyboard! Another nice write up. I warmed (gently) to this one. I think anologue controls may have stoked the fire a bit more. But that viewpoint……. ‘A grey haired friendly cat faced dragon with a penchant for showing you it’s scrotum comes along and takes you on a vandalism trip.’ – haha very funny Sull! I think that was written under the influence. A wine line if you will.